"Six Nations seek university credit courses"
The Six Nations has teamed up with six southern Ontario universities on a proposal to offer university courses on the reserve. Geared primarily to mature students, the program could give local native people an opportunity to take four full­-time courses at Six Nations as soon as next year. Students who successfully complete the classes would be accepted into a bachelor of arts program at their choice of the universities. The credits would count toward their degree. McMaster, Brock, Laurier, Waterloo, Western and Guelph universities are involved in the program. Rebecca Jamieson, who has been working on the proposal for 18 months, said the immediate goal is to help ease students into university. "If they could get a year under their belt and get four credits" it could help many students who might otherwise have abandoned their academic career. 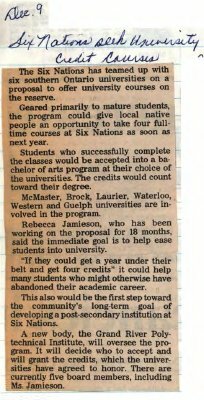 This also would be the first step toward the community's long-term goal of developing a post-secondary institution at Six Nations. A new body, the Grand River Polytechnical Institute, will oversee the program. It will decide who to accept and will grant the credits, which the universities have agreed to honor. There are currently five board members, including Ms. Jamieson.